Morphine is a benzylisoquinoline alkaloid with two additional ring closures. Most of the licit morphine produced is used to make codeine by methylation. It is also a precursor for many drugs including heroin (diacetylmorphine), hydromorphone, and oxymorphone. Replacement of the N-methyl group of morphine with an N-phenylethyl group results in a product that is 18 times more powerful than morphine in its opiate agonist potency. Combining this modification with the replacement of the 6-hydroxyl with a 6-methylene produces a compound some 1,443 times more potent than morphine, stronger than the Bentley compounds such as etorphine. The structure-activity relationship of morphine has been extensively studied. The structural formula of morphine was determined in 1925 and confirmed in 1952 when two methods of total synthesis were also published. As a result of the extensive study and use of this molecule, more than 200 morphine derivatives (also counting codeine and related drugs) have been developed since the last quarter of the 19th Century. These drugs range from 25 per cent the strength of codeine or a little over 2 per cent of the strength of morphine, to several hundred times the strength of morphine to several powerful opioid antagoinsts including naloxone (Narcan), naltrexone (Trexan), and nalorphine (Nalline) for human use and also the amongst strongest antagonists known, such as diprenorphine (M5050), the reversing agent in the Immobilon large animal tranquilliser dart kit; the tranquilliser is another ultra-potent morphine derivative/structural analogue, viz., etorphine (M99). Morphine-derived agonist-antagonist drugs have also been developed. Elements of the morphine structure have been used to create completely synthetic drugs such as the morphinan family (levorphanol, dextromethorphan and others) and other groups which have many members with morphine-like qualities. The modification of morphine and the aforementioned synthetics has also given rise to non-narcotic drugs with other uses such as emetics, stimulants, antitussives, anticholinergics, muscle relaxants, local anaesthetics, general anaesthetics, and others. 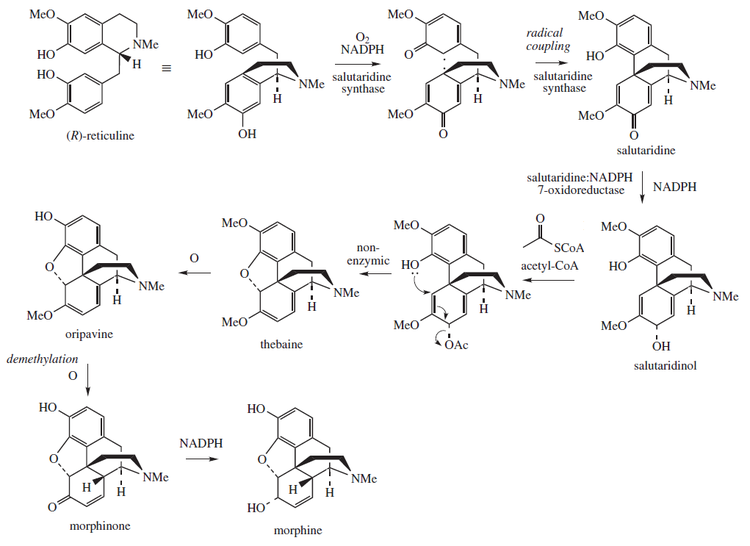 Halogenating or making other modifications at positions 1 and/or 2 on the morphine carbon skeleton. The methyl group which makes morphine into codeine can be removed or added back, or replaced with another functional group like ethyl and others to make codeine analogues of morphine-derived drugs and vice versa. Codeine analogues of morphine-based drugs often serve as prodrugs of the stronger drug, as in codeine & morphine, hydrocodone & hydromorphone, oxycodone & oxymorphone, nicocodeine & nicomorphine, dihydrocodeine and dihydromorphine, &c. &c.
Saturating, opening, or other changes to the bond between positions 7 and 8, as well as adding, removing, or modifying functional groups to these positions; saturating, reducing, eliminating, or otherwise modifying the 7-8 bond and attaching a functional group at 14 yields hydromorphinol; the oxidation of the hydroxyl group to a carbonyl and changing the 7-8 bond to single from double changes codeine into oxycodone. Modifications at positions 2, 4, 5 or 17, usually along with other changes to the molecule elsewhere on the morphine skeleton. Often this is done with drugs produced by catalytic reduction, hydrogenation, oxidation, or the like, producing strong derivatives of morphine and codeine. Both morphine and its hydrated form, C17H19NO3H2O, are sparingly soluble in water. In five liters of water, only one gram of the hydrate will dissolve. For this reason, pharmaceutical companies produce sulfate and hydrochloride salts of the drug, both of which are over 300 times more water-soluble than their parent molecule. Whereas the pH of a saturated morphine hydrate solution is 8.5, the salts are acidic. Since they derive from a strong acid but weak base, they are both at about pH = 5; as a consequence, the morphine salts are mixed with small amounts of NaOH to make them suitable for injection. A number of salts of morphine are used, with the most common in current clinical use being the hydrochloride, sulphate, tartrate, acetate, citrate; less commonly methobromide, hydrobromide, hydroiodide, lactate, chloride, and bitartrate and the others listed below. Morphine meconate is a major form of the alkaloid in the poppy, as is morphine pectinate, nitrate and some others. Like codeine, dihydrocodeine and other, especially older, opiates, morphine has been used as the salicylate salt by some suppliers and can be easily compounded, imparting the therapeutic advantage of both the opioid and the NSAID; multiple barbiturate salts of morphine were also used in the past, as was/is morphine valerate, the salt of the acid being the active principle of valerian. Calcium morphenate is the intermediate in various latex and poppy-straw methods of morphine production. Morphine ascorbate and other salts such as the tannate, citrate, and acetate, phosphate, valerate and others may be present in poppy tea depending on the method of preparation. Morphine valerate produced industrially was one ingredient of a medication available for both oral and parenteral administration popular many years ago in Europe and elsewhere called Trivalin (not to be confused with the curremt, unrelated herbal preparation of the same name) which also included the valerates of caffeine and cocaine, with a version containing codeine valerate as a fourth ingredient being distributed under the name Tetravalin. Closely related to morphine are the opioids morphine-N-oxide (genomorphine) which is a pharmaceutical which is no longer in common use; and pseudomorphine, an alkaloid which exists in opium, form as degradation products of morphine. The pharmacology of heroin and morphine is identical except the two acetyl groups increase the lipid solubility of the heroin molecule, causing it to cross the blood-brain barrier and enter the brain more rapidly. Once in the brain, these acetyl groups are removed to yield morphine, which causes the subjective effects of heroin. Thus, heroin may be thought of as a more rapidly acting form of morphine.. Illicit morphine is rarely produced from codeine found in over the counter cough and pain medicines. This demethylation reaction is often performed using pyridine and hydrochloric acid. Another source of illicit morphine comes from the extraction of morphine from extended release morphine products, such as MS-Contin. Morphine can be extracted from these products with simple extraction techniques to yield a morphine solution that can be injected. Alternatively, the tablets can be crushed and snorted, injected or swallowed, although this provides much less euphoria although retaining some of the extended-release effect and the extended-release property is why MS-Contin is used in some countries alongside methadone, dihydrocodeine, buprenorphine, dihydroetorphine, piritramide, levo-alpha-acetylmethadol (LAAM) and special 24-hour formulations of hydromorphone for maintenance and detoxification of those physically dependent on opioids. Another means of using or misusing morphine is to use chemical reactions to turn it into heroin or another stronger opioid. Morphine can, using a technique reported in New Zealand (where the initial precursor is codeine) and elsewhere known as home-bake, be turned into what is usually a mixture of morphine, heroin, 3-monoacetylmorphine, 6-monoacetylmorphine, and codeine derivatives like acetylcodeine if the process is using morphine made from demethylating codeine by mixing acetic anhydride or acetyl chloride with the morphine and cooking it in an oven between 80 and 85°C for several hours. Since heroin is one of a series of 3,6 diesters of morphine, it is possible to convert morphine to nicomorphine (Vilan) using nicotinic anhydride, dipropanoylmorphine with propionic anhydride, dibutanoylmorphine and disalicyloylmorphine with the respective acid anhydrides. Glacial Acetic acid can be used to obtain a mixture high in 6-monoacetylmorphine, nicotinic acid (Vitamin B3) in some form would be precursor to 6-nicotinylmorphine, salicylic acid may yield the salicyoyl analogue of 6-MAM, and so on. Homebake or other clandestinely-produced heroin produced from extended-release morphine tablets may be known as Blue Heroin because of the blue colour of some of these tablets, even though the coloured coating of the tablet is usually removed before processing, many strengths of the tablets are not blue, bluish or a related colour like purple, and the final product tends not to be blue. A writer of a 2006 description of producing heroin from 100 mg as well as some 30 and 15 mg MS-Contin type tablets coined the term Blue Heroin to distinguish his, her or their product from New Zealand-style homebake as the process was shorter and began with uncoated tablets which in the case of the 100 mg tablet was at or above 35 per cent morphine sulphate by weight, resulting in a final liquid injectable which was brown-purple and quite potent. The drugs present in the final product are limited to heroin, 6-monoacetylmorphine, 3-monoacetylmorphine, and morphine, with the 6-MAM being just as or more sought than the heroin for reasons elucidated in the Wikipedia heroin article. The clandestine conversion of morphine to ketones of the hydromorphone class or other derivatives like dihydromorphine (Paramorfan), desomorphine (Permonid), metopon &c. and codeine to hydrocodone (Dicodid), dihydrocodeine (Paracodin) &c. is more involved, time consuming, requires lab equipment of various types, and usually requires expensive catalysts and large amounts of morphine at the outset and is less common but still has been discovered by authorities in various ways during the last 20 years or so. Dihydromorphine can be acetylated into another 3,6 morphine diester, namely diacetyldihydromorphine (Paralaudin), and hydrocodone into the bacon. Raw opium contains some 20 alkaloid substances, one of which is morphine, in a typical yield of 10%. Morphine was first isolated in 1805 by Friedrich Sertürner, an apothecary's assistant in Paderborn, Germany, however its basic structure was not correctly determined until 120 years later. In the 1800s morphine (known then as laudanum) was a popular panacea and was available from grocers and markets. Later on its addictive qualities led to its use and availability being severely restricted. Morphine is isolated from opium in large quantities (over 1000 tons per year), although most commercial opium is converted into codeine by methylation. Morphine acts as an anesthetic without decreasing consciousness, and it is one of the most powerful analgesics known. However it also suppresses the respiratory system, and high doses can cause death by respiratory failure. Its analgesic properties are related to the ability of the molecule to fit into and block a specific receptor site on a nerve cell. This eliminates the action of the pain receptor, preventing the pain signals reaching the brain. This is similar to the way in which the body's natural painkillers (endorphins and enkaphalins) work. The shape of the morphine molecule is crucial to its ability to exactly fit into the active site on the receptor - the 'lock-and-key' mechanism. The benzene group of the morphine molecule fits snugly against a flat section of the receptor protein, whilst the bent neighbouring group of carbon atoms fits into a nearby groove. This allows the positively charged nitrogen atom to attach to a negatively-charged group on the receptor, so locking the two molecules together. Morphine blocks deep aching pain, but has no effect on the fast pain that results from injury. One side effect of the analgesic action is that the patient often gets a feeling of detachment from the world, along with euphoria and sometimes pleasure. It is this which makes morphine, and the other drugs related to it (such as heroin), attractive to those who want to use drugs for 'recreational' reasons. However all of these drugs are highly addictive, and the body rapidly gets acclimatised to their use, such that increasingly large dosages are required for the same effect. Morphine - replacing the -OH group shown in red with -OCH3 produces codeine. Replacing the both the red and blue -OH groups with OCOCH3 produces heroin. Codeine - the methoxy addition is shown in red. Pethidine - the parts of the molecule resembling the morphine structure are shown in red. The isolation of morphine was the beginning of alkaloid chemistry, which has yielded many important medicinal substances. Although a satisfactory theory of analgesic structure or action still eludes us, experimenters have developed a number of synthetic analgesics related to morphine. The oldest is pethidine (also known as meperidine, Demerol and about 40 other names). It was synthesised in 1939 by the German chemist Otto Eisleb. It is less potent than morphine, but is still widely used for the relief of post-operative pain. By replacing one of the -OH groups with a methoxy group, morphine is converted into codeine, another powerful painkiller. When mixed with paracetamol it goes by the trade name Tylenol. When ingested, the -OCH3 group is converted back to -OH, regenerating morphine. how the process of making codeine by methylation using morphine? and why the method of methylation in used ? and whether it can use another method? and how to modify the morphine that can be a non-narcotic drugs such as stimulants, vomiting, local anesthetics, and others? The methylation can be carried out as follows. The commercial morphine base is suspended in pure toluene by stirring. The mixture is heated to bring about distillation, which starts between 90°C and 100°C and is continued until the boiling point reaches 111°C. The remaining suspension mixture, which is now perfectly free of Water, is kept protected from humidity and cooled down to 14°C under stirring. Then, an appropriate quantity of the titrated solution of the methylating agent is added, this quantity containing an excess of 5%, The morphine dissolves immediately, and the solution is then brought to boiling; which starts at about 80°C. The alcohol distils off with a part of the toluene and distillation is continued until the boiling point again reaches 111°C. The remaining solution contains now codeine and dimethylaniline, but does not contain any morphine. The codeine can be extracted in the usual manner with dilute mineral acid, whereby the aqueous phase is kept only slightly acid to litmus (pH 4 - 4.5) to prevent dimethylaniline from being extracted together with the codeine. diasetilmorfin synthetic compound which is a derivative of morphine. Compounds diasetilmorfin white crystalline, odorless, and bitter is a compound that became known quite dangerous. Heroin is synthesized compounds diasetilmorfin which is a derivative of morphine. 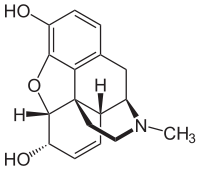 Heroin or Diasetilmorfin obtained from acetylation of morphine in both phenolic and alcoholic hydroxyl groups (3,6-diasetilmorfin).for more details you can see the structure of morphine and heroin. CO) yields a specific ester, acetate. Acetic anhydride is commonly used as an acetylating agent reacting with free hydroxyl groups. For example, it is used in the synthesis of Aspirin and heroin. the third paragraph of your article I read about the modification of morphine. The modification of morphine and the aforementioned synthetics has also given rise to non-narcotic drugs with other uses such as emetics, stimulants, antitussives, anticholinergics, muscle relaxants, local anaesthetics, general anaesthetics, and others. how do you or another friend???? yuli i have question about your material in this blog.The last step is purifying and separating morphine from other opium alkaloids. Opium poppy contains at least 40 different alkaloids, but most of them are of very low concentration. how to purify and separate the opium alkaloid morphine from the other? and explain one of the 40 different alkaloids contained in opium poppy? Ø Codeine (INN) or 3-methylmorphine (a natural isomer of alcohol morphine, the other being the semi-synthetic 6-methylmorphine) is an opiate used for its analgesic, antitussive and antidiarrheal. Codeine is the second most predominant alkaloid in opium, up to 3 percent, it is far more common (Papaver bractreatum) Iranian poppy, and codeine is extracted from this species in some places although the below mentioned morphine methylation process is still much more common. It is considered the prototype of the weak to midrange opioids. Ø Dihydrocodeine is used as an alternative or addition to codeine for these indications. It is available as the following salts, in rough order of frequency of use: bitartrate, phosphate, hydrochloride, tartrate, hydroiodide, methyliodide, hydrobromide, and sulfate. Salt to free base conversion factor of 0.67 is to bitartrate, 0.73 for phosphate, and 0.89 for the hydrochloride. Commonly available as tablets, solutions, potions, and other oral forms, dihydrocodeine is also available in several countries as a solution to the administration of subcutaneous and intra-muscular inside. As with codeine, intravenous administration should be avoided, because it can lead to anaphylaxis and dangerous pulmonary edema. In the past, dihydrocodeine suppositories are used, however, dihydrocodeine is available in suppository form on prescription. Ø Xanax or dihydrocodeinone is a semi-synthetic opioid derived from either of two natural opiates - codeine and tebain. Xanax is orally active narcotic analgesic (pain reliever) and antitussive (cough suppressant). It is commonly available in tablet, capsule and syrup form, and is often compounded with other, non-opioid compounds generally less effective as paracetamol (also known as acetaminophen) or ibuprofen, often added to both reduce recreational use (as paracetamol can potentially cause fatal liver toxicity at high doses), and to provide possible synergies between xanax and analgesic effects of non-opioid compounds this. However, the effectiveness and safety of hydrocodone compound products versus hydrocodone-only products remains a highly contentious issue. Ø Tebain (paramorphine) is an opiate alkaloid. A minor constituent of opium, tebain is chemically similar to both morphine and codeine, but stimulatory rather than depressant effects, causing convulsions similar to strychnine poisoning at higher doses  tebain this. Not used therapeutically, but can be converted into a variety of compounds including industry oxycodone, Oxymorphone, nalbuphine, naloxone, buprenorphine naltrexone and etorphine. Oxycodone oral medications are generally prescribed to relieve moderate to severe pain. Currently formulated as single ingredient products or products plus. Some common examples of compounding are oxycodone with acetaminophen / paracetamol or NSAIDs such as ibuprofen. These formulations are available as generics but are also made under various brand names. Ø Ethylmorphine (also known as codethyline, dionine, and ethyl morphine) is an opiate narcotic analgesic (pain killer). Ethylmorphine invented in Germany at Merck in 1884 and used as a weaker alternative to heroin for all indications. Chemistry, ethylmorphine is a morphine molecule-OC2H5 group substituted for the 3-OH aromatic. Therefore the closest chemical relative ethylmorphine is codeine, also known as methylmorphine. Ethylmorphine also has a hydromorphone analogue (ethyldihydromorphinone or 3-ethoxy-7 ,8-dihydro-Morphin-6-one), and dihydromorphine analogue known as ethyldihydromorphine, although none of them seem to be commercially distributed at the current time. please explain more details from your stated that heroin may be thought of as a more rapidly acting form of morphine..? because heroin in the brain due to hydrolysis into monoasetilmorfin rapidly and eventually into morphine, then undergoes conjugation with amino glukuronik menajdi morphine 6-glukoronid the analgesic effect is stronger than morphine alone. Drug accumulation occurs in patients with renal failure. I was perusing about dihydrocodeine & codeine phosphate and I discovered your blog which is very fascinating. I do trust it's alright with you on the off chance that I stick them on my Pinterest board. A debt of gratitude is in order for sharing! a little knowledge is dangerous, 98% of what has been stated here is gobbledygook, a potpourri of half truths with a lot of misunderstanding thrown in. The blind leading the blind. Just avoid drugs kids..